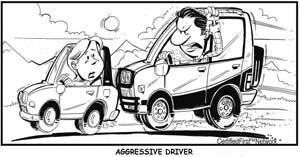 Drivers between the ages of 18 and 25 have the highest aggressive driving tendency. Estimates are that one out of five accidents resulting in injury has a direct link to aggressive driving. (Sources: Monica Milla, “Aggression & Road Rage,” UNTRI Research Review. Scott Bowles and Paul Overberg, "Aggressive Driving: a Road Well-Traveled," USA Today. Don’t yell or gesture at other drivers. Make safety a priority – don’t tailgate other drivers, and be sure to observe posted speed limits. Budget enough time for your trip – beginning a drive with the stress of being late can limit your patience with other drivers. Look for safe ways to relieve tension while driving – for example, find a type of music that is relaxing. Avoid driving directly beside another vehicle for an extended time – be sure there is a traffic lane or berm open in case of an emergency.